While the exterior of a home or an office is important, it is the interior that really sets a place apart. It is not uncommon to see people sending loads of money on ensuring that the interior stands out, whether it be on the furniture, tiles or other small fixtures and fittings. And when it comes to really boosting the interior, upholstery can take things up a notch. Therefore, it makes a lot sense to make sure that the upholstery remains clean and brand new. However, as most people would agree, this is easier said than done. As furniture comes into use, wear and tear overtime is common. Be it spillage from food or drinks or dust marks, upholstery is bound to get dirty. Fortunately though, instead of replacing the upholstery every now and then simply due to it being dirty, there are certain ways which can ensure that not only does it remain brand new, but in the process also allows you to save a lot of money. 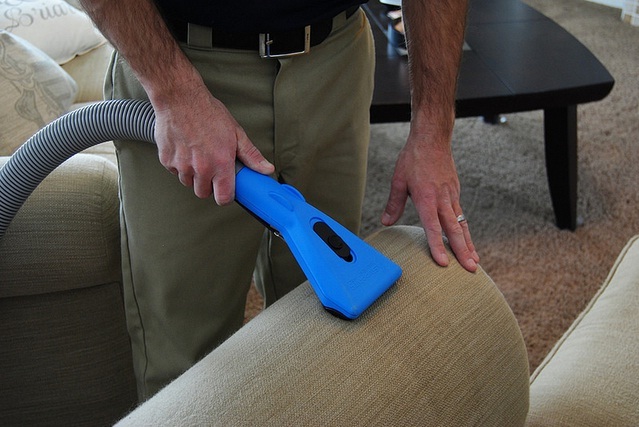 While other ways of cleaning upholstery may require certain skills and experience, vacuuming is easy yet greatly effective. To vacuum your upholstery, you simply have to purchase a nice, effective vacuum cleaner and clean the upholstery with it once or twice a month. If the furniture comes under extreme exposure and use, you should try and vacuum it immediately instead of waiting. This is because as time passes by, the marks and stains get harder to clean up. Vacuuming will also ensure elimination of loose particles and dry soils from every nook and corner. Again, as mentioned earlier, it makes sense to clean up the spill or stain immediately rather than wait for it to dry up. As time passes by, the stain or spill is likely to dry, making it really hard to pull it out. However, you shouldn’t just use any cloth or paper to do this. To make the process as smooth as possible, it is suggested that a clean white cloth is used. Moreover, instead of rubbing or scrubbing, you should merely just blot the stain. This way, not only will the mark keep away from spreading out, but it will also clean quickly. With the demand for interior cleaning increasing, a lot of companies have sprung up that offer similar services. One such company is Advanced Surface Solutions LLC and its services range from carpet cleaning, upholstery cleaning to a range of other services. The company has a team of professionals who are thoroughly experienced in this area and it caters to various different cleaning needs. Upon giving them a call, the company will send its team over to the specified place to carry out an inspection and advance with the process. While this will obviously cost a bit more than doing it yourself, the professional service will ensure that the job gets done.